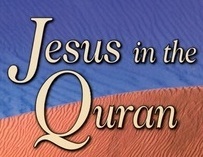 ﻿ JESUS IN THE QURAN — What Does The Quran Say About Jesus? Is Jesus mentioned in the Quran? Disclaimer: Below are the passages in the Quran about Jesus. This page simply shows what the Quran says about Jesus. It does not validate the Quran, which differs from the Bible regarding the deity of Jesus (see True Gospel). That should shift the focus from history to Jesus. Quran 19:20 1 says Jesus was born of a virgin. Quran 3:49 2 says Jesus performed miracles, including raising the dead. Quran 19:19 3 says Jesus was sinless, and Quran 4:158 4 says Jesus ascended to heaven. Muslims will agree with you when you remind them what these words in the Quran say about Jesus. They will stop agreeing with you, however, when it comes to Jesus' deity and cross, both of which the Quran denies (Quran 4:157) 5, as well as the Trinity. To explain Jesus' deity, see Prophet Isa. To explain His cross, see Muslim Messiah. To explain the Trinity, see Explain the Trinity. Muslims likely will search for counter-arguments to the evidences presented. If possible, encourage them to conduct their research anonymously and without involving other Muslims, who may pressure the researcher to terminate the research and contact with Christians, reminding them that even questioning the Quran is a grave offense. Many Muslims sincerely want to know the truth, and at some point will begin to read the Bible. When they do, they should start with the New Testament; the extent to which God favored the Jews over Arabs in the Old Testament is best read after the The Gospel. Ministry to Muslims does not end if and when they accept Jesus since their families often abandon or persecute them for it. Christians should be prepared to become the new family to love and protect our new siblings, many of whom truly give up all to follow Christ. Please read the disclaimer at the top of this page about the footnotes below. 4 "Rather, Allah raised him to Himself. And ever is Allah Exalted in Might and Wise." - Surah 4:158.